How better to spoil your mother on Mothers’ Day than with chocolate and cake all rolled into one? I have long thought that the flavours of Toblerone would lend themselves to a rather special cupcake, and this recipe is my attempt to prove it! The CCM (Caked Crusader’s Ma) is a fan of the triangular delight and subtly commented last week, “I really love cupcakes,”…a hint if ever I heard one! The chocolate kick came from a lusciously rich Ganache topping – if you chill it you can whip it up as you would a buttercream and pipe it. It tastes divine and has the texture of chocolate velvet! One word of warning, and it’s a tough lesson learned by me this morning – if you’re making a double batch of these cakes, the sponge doubles up no problem but make the Ganache as two individual batches because the doubled up amount just wouldn’t whip up to a thick enough consistency whatever I tried. When I started again and made it in two batches, it was fine. It wasn’t a lesson I would have chosen to learn on the morning of Mothers’ Day but hey ho...lessons learned like that aren’t quickly forgotten! Tiny Toblerones completed the homage to chocolate and almond and proved to be just about the most popular cupcake topper I’ve used! I’ve always loved Toblerone; growing up there was always a large bar amongst my Christmas presents (the CCM’s doing, of course!) but nowadays I associate it more with heading home. I used to travel a lot for work and you could always rely on spotting a bar of Toblerone in the duty free shop – just one sighting of the triangular bar meant you were homeward bound! Plus, what’s not to love about something that’s so crisply cornered that you can play Tetris with it when stacking it in your cupboard? Happy Mothers’ Day CCM, and all the other mothers out there, not least the CCMIL (Caked Crusader’s Mother in Law)! 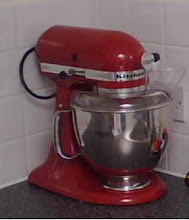 Preheat the oven to 190°C/fan oven 170°C/375°F/Gas mark 5. Line a cupcake pan with paper cases. Beat together the butter and sugar until light and fluffy. Don’t skimp on this stage as you want to get lots of air into the mixture. Stop beating when the butter and sugar looks almost like thick whipped cream. Beat in the eggs, almond extract, flour and milk. Stir in the chopped Toblerone. When the mixture is well combined, spoon into the paper cases. Bake for 12-15 minutes or until a skewer inserted into the cupcakes comes out clean. Mine took 15 minutes. Leave to cool on a wire rack and remove from the tin when cool enough to handle. To make the chocolate Ganache: Bring the cream to the boil in a saucepan. Remove from the heat and stir in the liquid glucose. Place the chocolate in the cream and stir until the chocolate melts. Leave to cool and then place in the fridge for 20 minutes or so before whisking to lighten the texture. How long this takes will depend on how much you have cooled the ganache mix – so don’t panic if it doesn’t seem like it will whisk, either keep going, or chill some more and try again in 15 minutes! If it isn’t firm enough to pipe, refrigerate for 30 mins and try again. Don’t let it sit for too long in the fridge or it will harden. Pipe or spread over the chocolate cupcakes. Decorate with tiny Toblerone or individual triangles of Toblerone. Bask in the glory of the wonderful thing you have created. I can well imagine they're your most popular cake toppers ever - such a good idea for toblerone lovers! Happy Mothering Sunday to the CCM and CCMIL! YUM! This is well and truly bookmarked. I've been slightly stressing over what to bake for my boyf's dad's birthday and I know he is a Toblerone fiend so he is having some of these I think! A great mothers day treat! You've got a very lucky mummy ! This is an interesting and lovely way to give Toblerone lovers toblerone! He he, you can see where my interests are most firmly fixed - I didn't notice the cupcake stand until you pointed it out. Of course now, I do want one. Cupcakes sound so good and I just love that ganache topping, it looks so delectable. Oh - My - Sweet - Jesus! They really are a Mothers' Day special. Just fabulous. Those piece of toblerone on top look like crowns :) I made a mousse out of toblerone once, it was delicious. Yours look delicious too, I hope you had a good day! Our mother's day here in the U.S. isn't until next month...which means I'd like still have time to try out these delicious cupcakes! Wow, those look and sound so yummy! Oh my goodness what a delicious treat! I hope she enjoys. I haven't had a Toblerone in ages. Perfect use of the bar in a cupcake. I hope she loved loved it. Normally I remember you always made lemon desserts for her.. Mother's will surely gain a little weight because of this irresistible chocolate cupcakes! Mommy's can't say no to this. Read my novel! Yes! I wrote it! Follow my ambitious attempt to find a recipe for a cake, biscuit, pie or tart for every single one of the 39 traditional English counties! So, the answer to the question you’re all asking: who am I? Well, a superhero never reveals their identity. I think it’s stated somewhere in the contract when you sign up for superhero-dom. Let’s just call me THE CAKED CRUSADER. 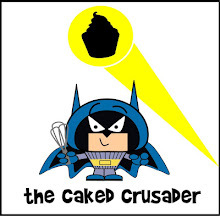 By day (and night if I’m being honest) a mild-mannered City professional, but at weekends I become THE CAKED CRUSADER. Tirelessly fighting anti-cake propaganda and cake-related injustices – for SOMEONE, SOMEWHERE, ALWAYS NEEDS CAKE (we’ll just skip over the fact that it’s usually me). The purpose of my blog is simple – to spread the word that CAKE IS GOOD. Yes, it is calorific; that is why it tastes so nice. Yes, too much of it is bad for you; that’s what ‘too much’ means. Yes, we’re all told to eat healthily and we know that we should. But ask yourself this – and look very deeply into your soul before answering – when has a cup of tea and a carrot ever cheered you up? However, put that carrot into a cake and happiness will ensue. Quod erat demonstrandum – CAKE IS GOOD. This site will catalogue cakes I have unleashed unto the world and my thoughts thereon. By the way, I will never recommend how many portions you should get out of a cake because we’re all different. Plus, it will be very embarrassing when I say it serves 4 and you get 20 portions out of it. WARNING: Too much time spent on this blog may cause hunger. Have you seen a cake in a film or tv show that deserves recognition? Has a cupcake upstaged a beefcake? If so, please let me know and that cake could win a coveted CAFTA award. Email me your suggestions, with a photo of the cake if possible. Baked & Delicious Magazine giveaway - Winner! I am a 40-something Chartered Accountant working in the square mile. My main hobbies at the moment are baking, and setting the world record for the number of cake tins owned by one person. I spend far too much time watching Spongebob Squarepants and would love to try a Krabby Patty...I know, I know - it's not real.